“Doo-Wop Groove in A” for guitar features a slow, relaxed feel. This song, which is shown in the following figure, uses major arpeggio patterns 1, 2, 3, and 4. 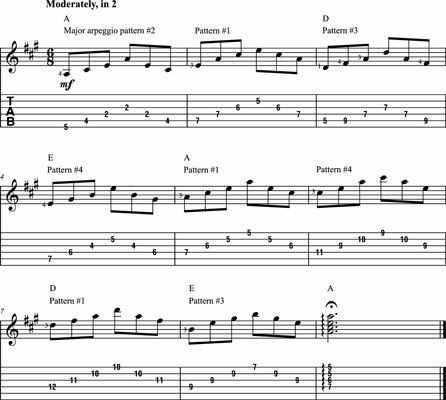 These patterns should be played in a flowing, legato style. You may notice that patterns 1, 2, and 4 correspond to the movable barre chords based on the open chords E, G, and C. Playing the notes of an arpeggio from within a held-down chord allows the notes to ring. The last bar of “Doo-Wop Groove in A” should be played as a chord form, and the wavy line tells you to separate the notes slightly instead of sounding them simultaneously. Don’t practice these sequences too slowly, because doing so tends to interfere with the natural swinging movement of the wrist and may affect your accuracy with a pick.